There was a time when our Wednesday night dinner crew, who drive from Ulster and Dutchess counties, would meet weekly in Kingston for dinner and cocktails. In the 1990’s one of our brethren had taken a job with the Shandaken police department. To accommodate him we would meet in Kingston, which was centrally located (once you added Shandaken into the mix). Grumpy told us he had taken a job as Chief of Detectives, but we later found out that Shandaken only had one detective, and he was it. 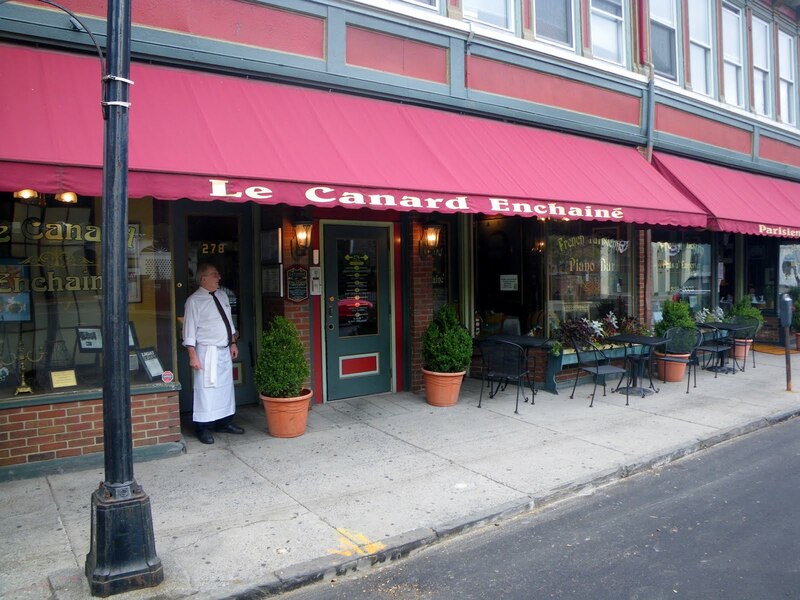 In any event his new employment turned out to be a most serendipitous event, as we were introduced to what would become one of our favorite stops – Le Canard Enchaine, a traditional French bistro on Fair Street. When Le Canard opened fifteen years ago, it quickly became the after work destination for area office workers – a motley collection of lawyers, bankers, brokers, detectives, realtors, and anyone else looking for a nice place to have a cocktail, talk politics, and take advantage of “bar snacks” that typically included pates, platters of clams and oysters, and duck confit. No need to have dinner with bar snacks like that, which Jean Jacques (the proprietor) finally figured out and scaled back on the goodies. It’s amazing how successful you can be if you’re willing to go broke doing it.Ah, the good old days. It really was “the place to go”. Jean Jacques tried to replicate the program in other locations – another Kingston venue, South Beach Florida, and most recently in Albany – but lightning doesn’t strike twice. As I have said in prior posts, success comes with some magic combination of place, and space, and people, and menu. Sometimes it clicks; most of the time it doesn’t. There will only be one Le Canard Enchaine. The space that houses Le Canard is an authentic reproduction of a classic Parisian bistro, complete with Jean Francois, your genuine French (accented) waiter minding the front of the house with Jean Jacque’s very French mother in law, Elizabeth. Elizabeth showed up at Canard after she closed her own French “country” restaurant, ValDisare in Big Indian. She is the consummate hostess. I think of Edith Piaf whenever I see her. The headwaiter, Jean Francois, has been there since day one, charming customers with his French accent (of dubious provenance). Jean Jacques himself will ideally stay in the kitchen, where he can put his substantial culinary talents to the best use and hopefully not bother the customers out front. We don’t get to Kingston as much as we used to, but do stop by on occasion as we did Sunday for a late lunch. The restaurant was offering their $14.95 prix fixe lunch menu, but were happy to accommodate our request to order from the regular menu. If you are a fan of French bistros, you already know the menu – escargot prepared with mushrooms or butter and garlic with a little Pernod, moules frites, cassoulet in the winter, a confit of duck, salad Lyonnaise, frog’s legs meunieres. The classics are all here. Yesterday I started with some escargot, served in a bubbling bath of butter and parsley and garlic with just enough Pernod to let you know the chef had some in the kitchen. Truly as good as it gets and the reason that someone invented baguettes. You need to dunk. Mary ordered the endive salad, another wonderful dish that Jean Jacques used to put out on the bar during cocktail hour. Dressed with chopped walnuts and bleu cheese, this is one of those classic combinations of flavors and textures that make you wonder who thought of it first. Wonderful stuff. Elizabeth mentioned that the kitchen had some calves liver, which is one of my favorite dishes. Generally speaking, liver is a dish that is only eaten out in restaurants. The reason, I believe, is that it is an acquired taste and rarely will you find six people at one table who really enjoy it, so it rarely finds a spot at home dinner parties. When we who love liver see it on a menu, we usually take advantage of the offering. It became one of my favorites shortly after I left my parent’s home and tried a piece from a dining companion’s plate in a restaurant – I think the Airport City Diner in Queens. It was served rare, which I had never seen before, smothered with sauteed onions and covered with strips of bacon. It was then that I realized that my mother had no clue how to cook liver, which she fried in a cast iron pan until the pan and the liver were of equal color and rigidity. (I later found out that liver was actually one of her strong suits. Someday I’ll tell you about her spaghetti and meatballs.) But I digress. Jean Jacques liver is also served with bacon and onions and slices of roasted potatoes. Mary also tried one of his standby classics – the duck confit. It was on this Sunday’s menu as an appetizer – a serving of one hind quarter. Sometimes it shows up as an entree with a double portion, and sometimes he serves a confit of duck breast, which is unique, at least to me. It is always well prepared, and something that I look forward too. Le Canard’s one failing is the wine list, which has always been an issue. The wine selections have never matched the kitchen, which is really noticeable, since the place has so much to offer. I would love to see a glass of Beaujolais or Bourgogne Rouge, or a Macon offered by the glass, all typical bistro offerings. We drank a Pinot Grigio and a California Pinot with our meal. As good as they were, it was really a shame in a nice French bistro like this. But I was happy to see that Le Canard is still going strong. The bar, empty on Sunday afternoon, still looks inviting and waiting for a party to get started. I hope to be there again soon to join in. If you do stop in please let our readers know about your visit in the comments section. I'd always meant to get to it when it was in Albany. But I suppose so many others figured they'd 'just get to it soon' too. C'est la vie. I'll have to get to Kingston some time.